>Breykara/Breiokara: Thoul for ‘human’ (Breykar is the name used by Orimaran humans; Breiokar the term used by Oramidran humans; in Koie, the term is Seodikar, which means ‘men of the borderlands’); more literally, ‘tool-wielding man/men’. Their technology and knowledge is comparable to Earthly humans at the turn of the 20th century. >Other humans living in Pathallea: Dreybra; the dark-skinned, hunter-gatherer peoples of the southern Koie islands. Koie was once the land of a Yoleukar/Alka hybrid, and is responsible for the present natives’ Atiatwa language variant. The humans of Breykaria think now that these aborigines came up from the southern-most reaches of Koie, after the first Great War that occurred a thousand years prior. Dreykara, Lykara, and Sidiyokara; the dark-skinned inhabitants of the Piaromea archipelago. They are also hunter-gatherer peoples, but while the Dreybra have a largely unified tongue, these peoples have literally dozens; most of which are confined to the tribes that speak them. >Yoleukara: The true Thoul meaning for this race has long since been lost to Time — as ‘yoleu’ can mean either ‘friendly’ or ‘primordial’ in modern Thoul. Each is equally fitting. They are a tall, four-armed race known in myth as being the very first race on Pathallea. Despite levelling-off, technologically, over the past millenia, while the Slenka have been advancing, the Yoleukara are still the most advanced beings alive. >Alka: Two-armed beings related to the Yoleukara and Slenka. Despite receiving much interaction and trade with the Yoleukara, the Alka have almost always been considered as third-most advanced, with the Slenka coming in second. Like the Yoleukara, the Alka are tall, strong, and with coloured skin. >Slenka/Slenkara: ‘Slenkara’ means literally, ‘the evil/sickly ones’; ‘Slenka’ is an oft-used, shortened version of ‘Slenkara’. Like the Yoleukara, the Slenka possess four arms and mono-toned skin. They are the creators of a grizzly technology called the ‘Gwyva’ by humans… they are shaped like needles, work like a ‘hive-mind’, and spells death-of-mind for any living thing unfortunate to have touched it. First used during the first Great War that they spawned, it also comes to play a central role in their resurgence a thousand years later. >Rycka: The stunted, odd-looking beasts that inhabited Ile Kyira before the Slenka moved in thousands of years ago. Like the Yoleukara and Slenka, they speak an ‘Atwa language, and they have four strong arms. They were the subjects of the Slenkan ‘Gwyva’ before the first Great War erupted. >Other beings found in the book: Gwyvida; in Thoul translates as ‘gynoid’ (the male counterpart is Gwykara, or, ‘android’). Gwyvida and Gwykara are beings of artificial intelligence that otherwise look like a natural being — their irises give them away, as they are always unnatural-looking. Typically they take the form of a Yoleukar or Alka, but human forms have also been designed. ‘Furries’; stout, hairy beings that live on Payolla. They are comparable to ‘cave-men’, and they speak a complex click-language. ‘Yolu-human’ hybrids; interbreeding between a human and a four-armed being will result in a hybrid being that looks human but is strong and possesses four arms. Three such beings are known of during the course of the book, including its main character. Sound intriguing…? Hope so! If so, then please stick around for more to come in the following days and weeks, with respect to this book. More on the characters and the languages of Pathallea soon enough! Sci-fi/fantasy authors — what races/beings are in your novel(s)? What are they like? Feel free to share! Anyway.. I’ve found that depression and bullying are equally misunderstood and equally unnoticed phenomena — and they can often afflict a person at the same time. That was certainly the case with me, growing up. For me, it certainly wasn’t about wanting sympathy for my depression(s) — indeed, I often said “I’m fine” when I wasn’t specifically to avoid it. What I wanted was a ‘way out’. A friend, usually. I gather that’s what most depressed people want; which is why suicide is always a possibility with the worst-affected. It’s the same, largely, with bullying. The best thing to do for a victim of bullying is to give them a way out of it — getting the bully to stop is best, whether by empowering the victim to make them stop or by standing up to them yourself. They thought I just looked that word up in a dictionary and only trying to use it in a sentence. All I received were strange and weird looks and awkward stares. They told me I was just a kid and I shouldn’t worry about things a lot. Good stuff! I’ll be there soon enough…! All names are given in the language of the humans of Pathallea — called Thouldaara (‘Thoul’). 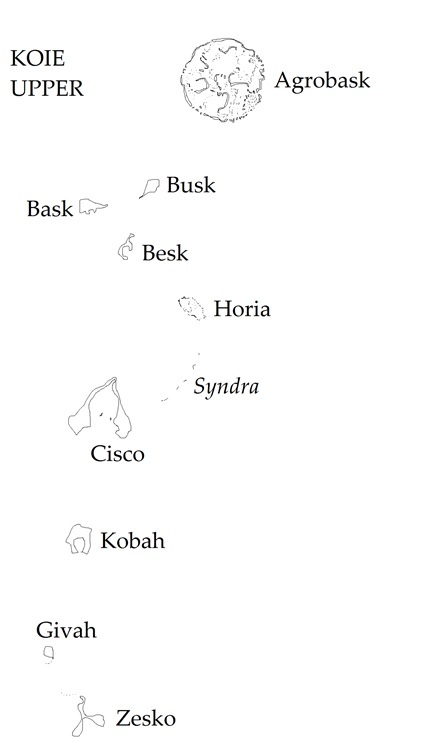 Both ‘Piaromea’ and ‘Koie’ archipelagos are divided into three sections, the north-most of the two being known and explored. 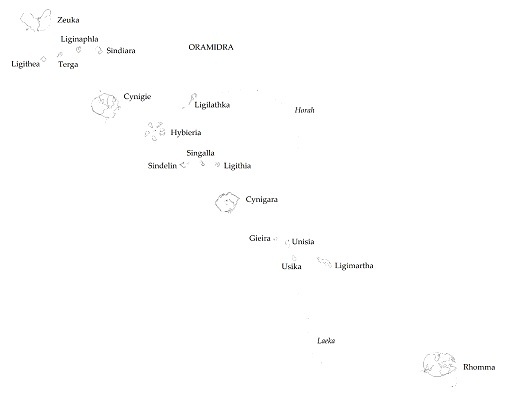 Stars denote ‘capitol’ islands — Tereik and Terikoua for Yol Kyire, Arkoul for Ile Kyira, Agrobask for Koie (upper), Priethka for Orimar, and finally Cynigie for Oramidra. *Yol Kyire is inhabited by two ‘elven’ beings; the Alka and Yoleukara. 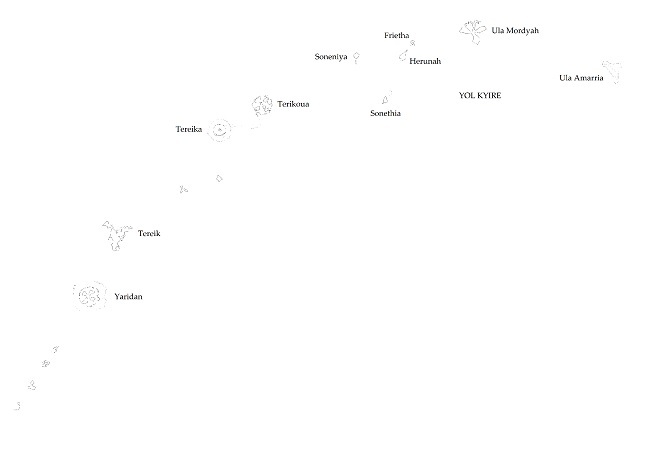 The Alkan ‘capitol’ is Terikoua, while the Yoleukar’s is Tereik. Ile Kyira is inhabited by more vile entities; the Slenkara (aka, ‘Slenka’, which are the more advanced race) and the Rycka (not as intelligent). 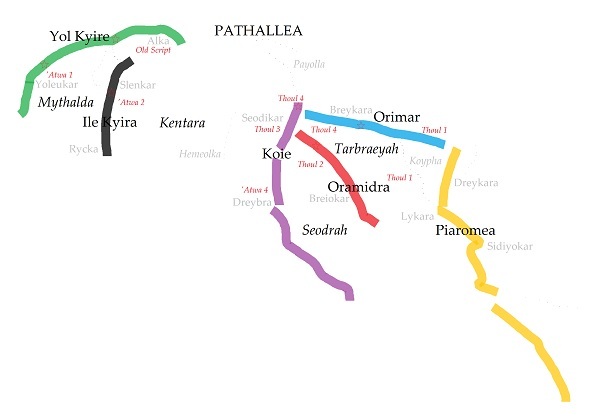 *The human-occupied Pathallea is confined to the lands east of the sea called ‘Kentara’… Much of the Koie and Piaromea archipelagos are inhabited by tribal-like humans, while Orimar, Oramidra, and the ‘Koie Upper’ chains comprise the ‘civilized’ populations — these lands are collectively often called Breykaria, as ‘Human’ in Thoul is ‘Breykar’.